I bought a video camera when my son was born and boy do I wish I had read this book then. 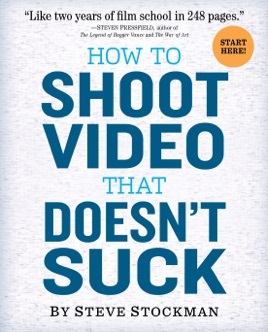 After 9 months of aimlessly shooting and editing video I read this book and my shooting and edited movies instantly improved. Simple tips to help anyone improve their video skills told in a fun entertaining way with plenty of examples and exercises. Highly recommend to anyone who owns a video camera. Thanks Steve! This book is the map and the inspiration that any film maker or film enthusiast should have under their belt. Full of ideas and motivational quotes and guidelines to keep you thinking and constantly improving. I want to shake Steve's hand. Now excuse me while I go shoot a masterpiece thanks to this book.